The UFC continues their global reach, as they touch down in Zagreb, Croatia for the very first time. The fight card heavily (pun intended) consist of Heavyweights, including an all important one in the main event. It’s important to note though, that this card is definitely missing mixed martial legend Mirko Cro Cop. The hometown fighter is currently serving a two year suspension, essentially for admitting the usage of human growth hormones (HGH). It’s sort of bizarre too, given that he never failed the drug test administered by the United States Anti-Doping Agency (USADA). It’s a real bummer for the UFC too, as they are trying to tap into these new markets without top local talent. Mirko Crop Cop headlining Zagreb, Croatia would of been huge, but instead they will be treated with a solid main event in Ben Rothwell vs. Junior Dos Santos. Anyways, to the Predictions! 265 lbs. : Ben Rothwell vs. Junior dos Santos – I might be one of the few who believe this, but strategically Ben Rothwell is a genius for booking this fight. As we all know, Rothwell is on a tear. He’s riding a four fight win streak, one in which he has won by TKO over the likes of Alistair Overeem and Brandon Vera, as well as submitted the likes of Matt Mitrione and Josh Barnett. 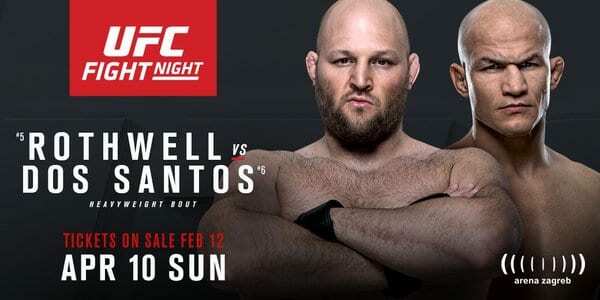 It’s clear that Rothwell is a win away from most likely fighting for the title, so what better way then to fight the former UFC Heavyweight Champion Junior Dos Santos. I’m not saying that Dos Santos isn’t capable of winning this fight, but it’s certain that he’s been a shell of himself since enduring two beat downs from Cain Velasquez. Regardless though, we are talking about heavyweights here. The hardest hitters on the planet, where one punch usually ends the night (see Mark Hunt). As for a prediction, it’s hard not to ride the coattails of Rothwell. He knows the stakes of this fight and the impact it will have on his fifteen year career. I believe that Rothwell will win this one via submission. 265 lbs. : Gabriel Gonzaga vs. Derrick Lewis – I’m still surprised that Gabriel Gonzaga is still around, especially considering how bad he looked in his win over Konstantin Erokhin. He looked like a guy that had mileage on him and lack of killer instinct, something that has led to him finishing all his opponents up until that fight. All these are tell tale signs to me of a career winding down, one in which has been a solid one. However, Gonzaga will try and prove that he has something left in the tank against a monster in Derrick Lewis, who is on a little tear, with two TKO victories. You know what, Check Please, make that three TKO victories! 265 lbs. : Francis Ngannou vs. Curtis Blaydes – Francis Ngannou is a physical specimen, with legit power in his hands. His kryptonite however is wrestlers, which Curtis Blaydes excels at. In fact if you recall, Ngannou was taken down over and over against a sub-par wrestler before knocking him out. Blaydes from what I seen, is a solid wrestler and I’ll take him here to finish Ngannou late! 265 lbs. : Timothy Johnson vs. Marcin Tybura – It’s about time that the UFC invests in finding talent in their Heavyweight division. However, Tybura’s style isn’t the most exciting. He really doesn’t excel in striking or wrestling, but seemingly gets the job done. Timothy Johnson is decently well rounded, but his strength seems to be in the clinch. He also has an “OK” gas tank for a heavyweight, which I think will help him edge this one out by decision. My confidence of this fight is no where to be seen though…so take this with a grain of salt. 205 lbs. : Jan Blachowicz vs. Igor Pokrajac – So, when I mentioned before that when the UFC touches down in these local markets, they usually try and get local fighters on the card. Well, Igor Pokrajac is that local fighter and this will be his second stint in the UFC. Unfortunately, I don’t think it’s going to be very successful return, as I think Jan Blachowicz is just better than Pokrajac everywhere. Now, Blachowicz is no “Monster”, but he has enough tools to put away Pokrajac at some point. Blachowicz via TKO! 115 lbs. : Maryna Moroz vs. Cristina Stanciu – I’ve only seen Moroz fight, as she upset Joanne Calderwood and then loss to Valerie Latourneau (Who then fought for the title). It’s kind of crazy too, that those were her first two fights in the UFC. However, the division is still young and in development, that you can kind of expect to be thrown into the wolves right away. Anyways, Moroz doesn’t really have great striking, but her grappling is superb. And since I know nothing about her opponent, I’m just going to side with Moroz via submission (Terrible way to make predictions). 170 lbs. : Zak Cummings vs. Nicolas Dalby – Zak Cummings is an interesting fighter, I mean the guy was able to win a round against Gunnar Nelson before succumbing to a submission later in the fight. He’s shown to be extremely powerful at welterweight and has an ability to grind you out. Dalby is a well rounded fighter that bring a high pace to the fight. He’s a volume striker that will keep you on your toes the whole three rounds. I’m very conflicted in a prediction here, but I’m going to side with Cummings to grind out a decision victory. 135 lbs. : Ian Entwistle vs. Alejandro Perez – Entwistle by leg lock? You know what, I’ll lock that in. 135 lbs. : Filip Pejic vs. Damian Stasiak – I have absolutely no idea who these guys are, which is the problem when you have over 500 guys on the roster. I’m going with Stasiak though for no reason….